The ceremony follows the years-long effort to recognize the soldiers with Congress’ highest civilian honor. WASHINGTON, D.C. — Congresswoman Tulsi Gabbard (D-Hawaii), Sen. Mazie Hirono (D-Hawaii) and congressional leaders presented the Congressional Gold Medal to Filipino World War II Veterans on Oct. 25 at the U.S. Capitol. 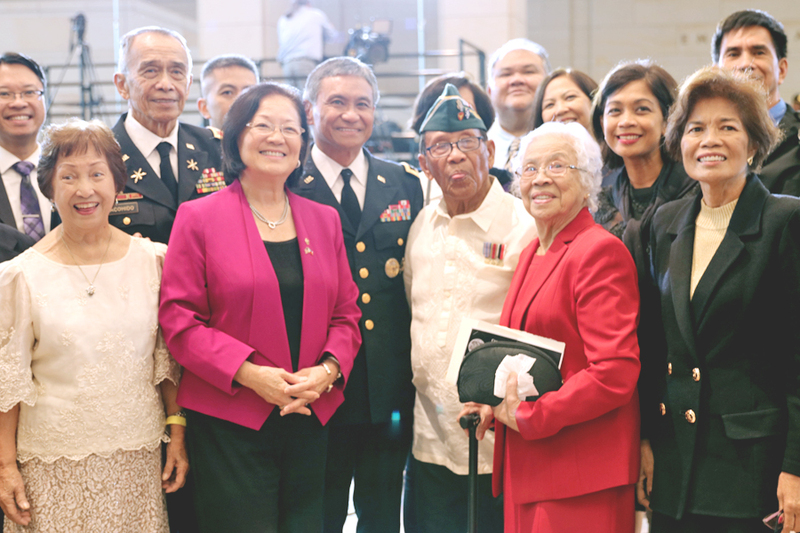 The presentation ceremony was the culmination of Congresswoman Gabbard and Sen. Hirono’s years-long effort to recognize Filipino WWII vets with the Congressional Gold Medal, Congress’ highest civilian honor. “The United States is forever grateful for the service, bravery and perseverance of the more than 200,000 Filipino and Filipino American soldiers that serviced our country during World War II,” said Gabbard. “These loyal and courageous soldiers suffered hardships, fought bravely and sacrificed greatly, with many giving up their lives alongside their American counterparts throughout the war, yet their service was left unrecognized in the U.S. for decades. 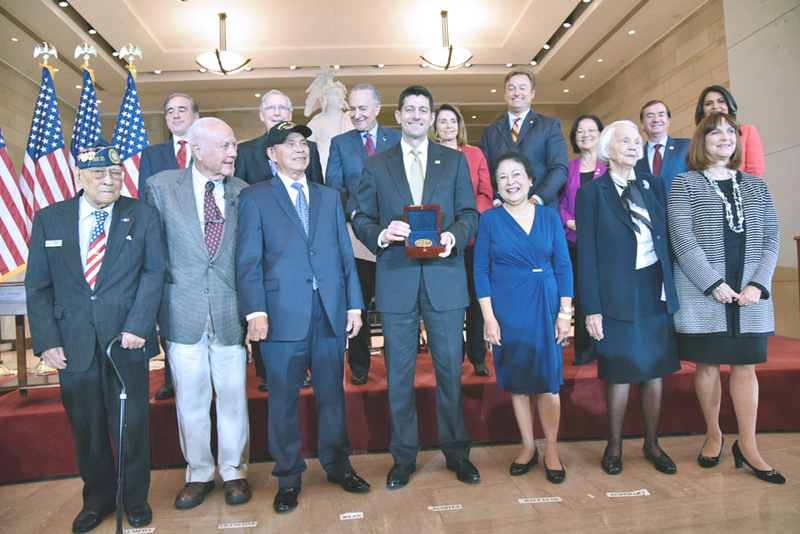 House Speaker Paul Ryan (center), Sen. Mazie Hirono (third from right, back row), Rep. Tulsi Gabbard (back row, far right) and congressional leaders presented the Congressional Gold Medal on Oct. 25 to Filipinos and Filipino American veterans who served in the U.S. Armed Forces during World War II. “Today, these brave soldiers are finally receiving the recognition they earned and deserve and join the ranks of heroic units like the Tuskegee Airmen and Hawaii’s own 442nd/100th Infantry Battalion as we honor them with the Congressional Gold Medal — our nation’s highest civilian honor,” added Gabbard. Secretary of Veterans Affairs David Shulkin, Majority Leader Mitch McConnell (R-Ky.), Senate Democratic Leader Chuck Schumer (D-N.Y.) and House Democratic Leader Nancy Pelosi (D-Calif.) joined Gabbard and Hirono in presenting the medal. Congresswoman Tulsi Gabbard addresses attendees at the Congressional Gold Medal Ceremony. Gabbard and Hirono’s law, the Filipino Veterans of World War II Congressional Gold Medal Act (Public Law 114-265), was signed into law by President Barack Obama and awarded the medal collectively to the more than 260,000 Filipino and Filipino American soldiers who responded to President Franklin D. Roosevelt’s call to duty and fought under the American flag during WWII. And on Oct. 24, Hirono and Rep. Colleen Hanabusa (D-Hawaii) introduced a bicameral resolution recognizing October 2017 as Filipino American History Month.